Many knitters also enjoy spinning, making their own yarn to use in their completely one-of-a-kind projects. I'll admit I've never spun any yarn, but I've always wanted to try it, and with the guidance of the new book Spin to Knit: The Knitter's Guide to Making Yarn by Shannon Okey from Interweave Press I just might get the courage to try it myself. Okey refers to herself as an "urban spinner," one of that new generation of knitters, designers and spinners who puts a new twist on the old traditions. Now is such a fun time to be a crafter and fiber artist because of people like Okey who don't accept tradition as the way it always has to be done. Her fun book provides instruction on spinning different kinds of fiber into yarn (plus the projects to use your yarn on) and even using materials you might not consider fodder for your knitting projects, such as dog hair and fabric scraps. The book is full of inspiration and stories to get those of us who are a little intimidated by spinning over our fear and have us spinning (with our own homemade spindles made of old compact discs) in no time. I recently caught up with Okey and talked about getting started spinning, inspiration and her favorite spinning projects. LovetoKnow: How did you get into spinning and knitting? 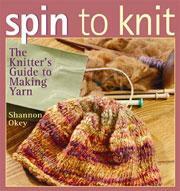 Shannon Okey: I knew the basics of knitting already, but in 2002 both came to a head when I moved to Boston . . . conveniently around the corner from a yarn store! Lucy Lee of Mind's Eye Yarns in Cambridge, Massachusetts, was instrumental in taking my knitting skills to the next level, and teaching me how to spin. I had been halfheartedly attempting to knit a scarf for ages, but when I signed up for lessons Lucy asked me what I really wanted to knit. "A cardigan," I said, and she pointed me to the yarn wall. Her only suggestion was that I make it gray, rather than black-easier to see the stitches! I had it finished within a month. Not long after, I walked in and asked her to order me a wheel. She did. When it arrived, I signed up for another lesson. LTK: Which is your favorite pastime? SO: Depends on my mood: if I'm tired and want to crash on the couch, it's knitting, but if I have a new fiber to try, spinning wins every time. LTK: How have your skills evolved over the years? SO: I've added to my repertoire by learning various methods of dyeing, plying, and other yarn customizations. And I've really learned to let beautiful handspun yarns shine on their own. You don't need a lot of fancy yarn to make a powerful statement in a garment or accessory; that's why the patterns in Spin to Knit work so well. SO: Sharing tricks and techniques with other spinners, and inspecting interesting yarn that crosses my path, even if I don't know who made it! This is one reason I insisted on traveling to meet the featured spinners who appear in this book-it really helps to see a person's daily inspiration, from their city to their friends and family to their studio and material. Not one of them were alike but for the love of fiber! If you aren't in love with your art, you can't be inspired to grow, improve, and share it with others. LTK: What's the best advice you can give to a new spinner? New knitter? SO: Experiment! It's only wool . . . it's only dye, it's only a stitch. You can tear it out or overdye it or mix it with something else if you don't like the first results. Does a pattern call for purple and you hate purple? Change it! Over 75 percent of all knitters knit a pattern in the same color as the sample in the magazine or book. As a spinner, you have the chance to make yarn no one's ever seen before . . . and by that same token, knit a pattern in a way it's never been knit before. So do it! LTK: What's your favorite project in the book? SO: I treasure the Cooper Moose Shawl that Crystal Canning made, and I'm happy she lives on to inspire other spinners and knitters despite her sad and untimely death. Of my own patterns in this book, I'm pleased with the Swedish Heart shrug, though I'm already itching to make it in a different weight of yarn. LTK: What's your favorite spinning project that you've done? SO: The Eddie sweater! My original spinning teacher Lucy Lee met me in Maine on her friend's farm, where I was introduced to Eddie, a gorgeous Romney ram. More like a big dog than a sheep, Eddie had a real personality . . . and so did his fleece! I bought it, took it home to Boston, and proceeded to teach myself how to wash a fleece properly, how to card it, and how to spin it from the ground up. I didn't start with a soft, well-prepared roving for my first project, I started with Eddie. It eventually became a very treasured handknit roll-neck pullover, which you can see in the introduction of Spin to Knit. This beautiful book tells you everything you need to know about making your own yarn, even if you don't know the difference between angora and alpaca (the first comes from rabbits, the second from a camel-like animal). You'll learn how to choose fibers, make or buy your own spindle, use it to make delightful yarn and use that in all sorts of projects, from hats to wraps to socks. It just might even help me get over my fear of spinning because now I know what beautiful projects I can make and that it doesn't have to be ahuge investment in time or money to spin great yarn.